Discover the Many Advantages of a Lyric Fireplace! Ortal has created fireplaces that are as stunning and impressive as they are accessible. From the same team that brought you Cool Wall Technology and the Outdoor/Indoor Gas Fireplace comes Lyric, a new line of value-engineered modern gas fireplaces. Lyric fireplaces give you many of the same advantages as Ortal fireplaces, with even fewer constraints. Here are just a few of the benefits you’ll get when you buy a Lyric fireplace. A fireplace in the middle of the hallway? In a bedroom? Inside a studio apartment? Years ago, such feats might have been impossible, but, with modern technology, it’s as easy as installing a Power Vent. Capable of circulating air up to a distance of 90 feet, Lyric’s powerful system increases your venting range by 50 feet. With three times the number of bends, you can free yourself from the most common and restrictive design constraints. We work hard to break down design barriers so clients can create the interiors of their dreams. As part of our commitment to versatile design, we created a line of fireplaces that was slimmer and shallower than anything we had previously built. The goal? To open up a world of design possibilities. 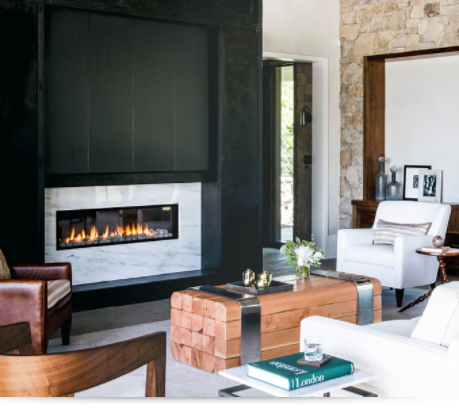 Now, with a Lyric fireplace, you can install a beautiful modern fireplace nearly anywhere. Ortal’s Cool Wall Technology has helped revolutionize fireplace design, and we’re proud to include it as a feature on our Lyric models. When cool air circulates between the fireplace and the wall, the surface remains at a safe temperature. As a result, you can place delicate materials (i.e., canvas paintings or wood sculptures) on or near the fireplace. You can also hang a television directly above the fireplace if you want both beauty and entertainment in one glance. Every Lyric fireplace comes with a safety screen barrier as a standard feature. We designed this pre-fitted, micromesh screen to be as unobtrusive as possible, while still offering the same level of protection. Safety barriers are particularly important in homes with children. They ensure that wandering hands don’t get severely burned when trying to touch the glass. Front Facing Fireplace: A simple, timeless design and sharp, clean lines make our Front Facing Fireplace an instant classic. Stand Alone Fireplace: Our most unique fireplace, our take on the wall-mounted fireplace conjures up images of the past while offering all the conveniences of a modern gas fireplace. Charming and easy to install, it’s perfect for those who want a fireplace with a little character. See Through Fireplace: This Double Sided Fireplace is our most modern, most innovative model yet. Offering a view of the flame on both sides of a wall, this fireplace catches the eye and warms the heart. Traditional Fireplaces: Go back to the days before smartphones replaced conversation and fireplaces were the centers of the home. Combining modern direct vent technology with classic design, our Traditional model is our coziest, homiest fireplace. Corner Fireplace: Why waste space when you can fill even the nooks, crannies, and crevices with stunning beauty? Our most unexpected model, the Corner Fireplace is visible from the front and the side of a wall. Peninsula Fireplace: Combining the transparent beauty of a See Through Fireplace with the unexpected allure of a Corner Fireplace, the Peninsula model both stuns and delights. Three Sided Fireplace: Offering a panoramic view of the flame, the Three Sided fireplace transforms an entire room. Our most exquisite model, this fireplace is a favorite all over the world. 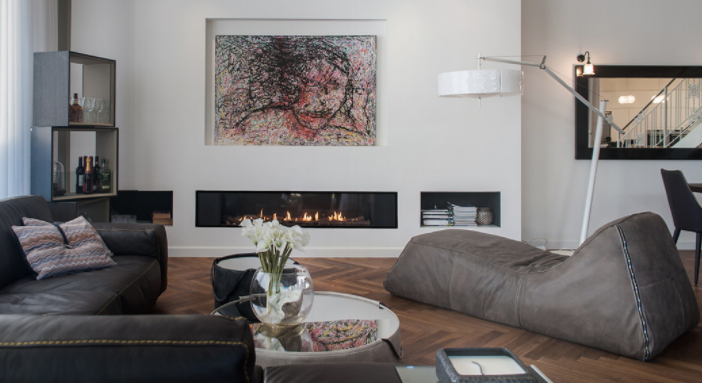 Ortal has been at the forefront of fireplace design for years. So, why did we launch another line of direct vent fireplaces? Because we wanted more people to enjoy the beauty and efficiency of our models. In order to put luxury within reach of everyone, we value-engineer each fireplace to achieve the perfect balance between quality and accessibility. Take a look at our catalog to learn more.